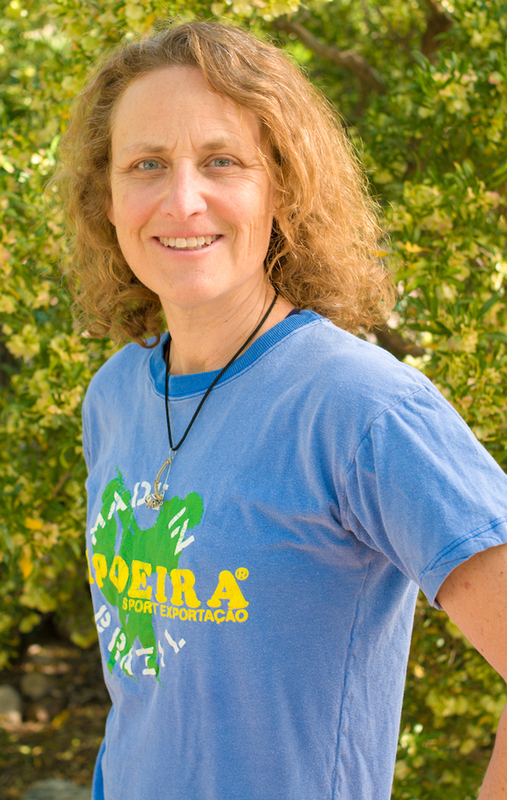 Anne Pollack (Mestra Luar do Sertão) began training capoeira in the San Francisco Bay Area in 1986 with the founder of Capoeira Mandinga, Mestre Marcelo Caveirinha. She trained with Mestre Marcelo until 1996 while completing her PhD in Anatomy and Cell Biology at the University of California, San Francisco. Mestra Luar has traveled all over Brazil, Europe and the US to train both Capoeira Regional and Angola, spending the most time in Salvador and in São Jose dos Campos where her capoeira padrinho Mestre Lobão (Capoeira Besouro Mangangá) is based. Mestra Luar received her capoeira nickname, Luar do Sertão (moonlight over the desert outback), from Mestre Suassuna many years before moving to the desert Southwest. She loves the beauty, sunsets, lightning storms and desert creatures (even the scary ones) of her Sonoran Desert home. 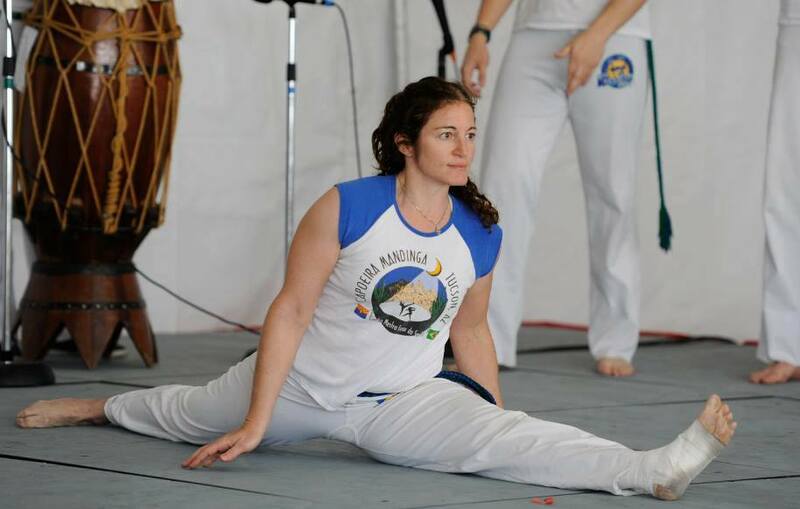 Since moving to Tucson, Arizona in 1996 she founded Capoeira Mandinga Tucson. She has over 20 years of experience teaching ages three through adult capoeira and Brazilian arts at her group’s Capoeira Mandinga Tucson Academy, the University of Arizona, Tucson, Nogales, surrounding Pima and Santa Cruz county colleges, K-12 schools, libraries, senior centers, businesses, events and festivals. She also created GingaFitTM, a fitness program designed to make capoeira and Brazilian dance movements accessible to fitness enthusiasts of all levels, and Luar’s Bodyweight Fitness, a program to improve functional fitness by increasing full body strength, flexibility, and balance. Anne has taught capoeira around the US. She is also the director of the Capoeira Institute Southwest which focuses efforts to bring capoeira to underserved populations in the Southwest. She has a heart-felt love of capoeira and dedication to broadening multicultural experiences for all ages. She understands the difficulty of balancing time between family, academics, work and passion for capoeira. She aims to inspire students to find their core strength by building skills to understand and express their individuality, communicate and have fun in both the capoeira game and in every day of life. David Vick (Feiticeiro) has played capoeira for over 10 years. He currently teaches capoeira full time for The Presidio School in Tucson, AZ. 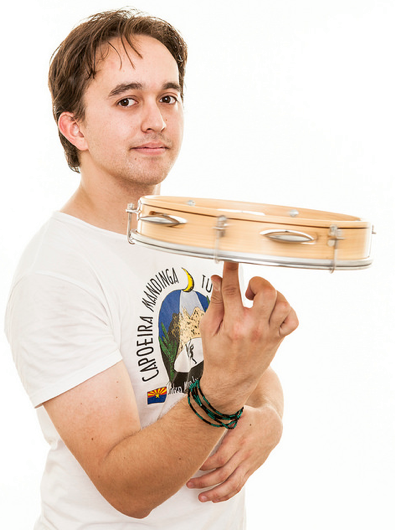 He has led workshops locally and across the country for kids and adults in capoeira and maculelê and has performed for many arts and cultural festivals. David is also an actor, stage combatant and painter. When not teaching, training or performing, he does volunteer work with the Arizona Avengers, a charity superhero costuming group. Abby Limmer (Tarantula) began capoeira many years ago while finishing her MA at the University of Arizona. She has since completed her PhD in Near Eastern Studies. Her bite is painful, though her venom is virtually harmless to humans. Tarantula is a slow and deliberate mover by nature, but is an effective predator nonetheless. She is very scared of the local tarantula hawk wasps, but not of capoeiristas, because she has eight legs to kick with. She hopes to break 5’4” next time she molts.